The crickets here who are making all the noise are tiny, like miniaturized versions. 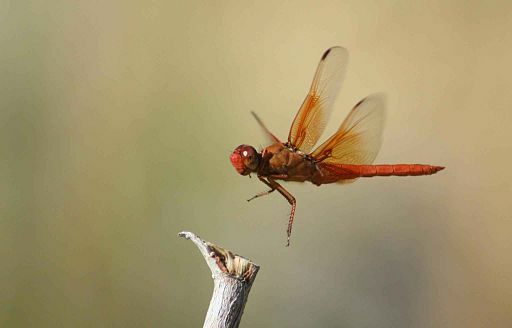 The dragonflies are delicate creatures, too, needle thin, brilliant green, orange-red, and sky blue, sometimes flying united, two fragile bodies connected in a mating dance. 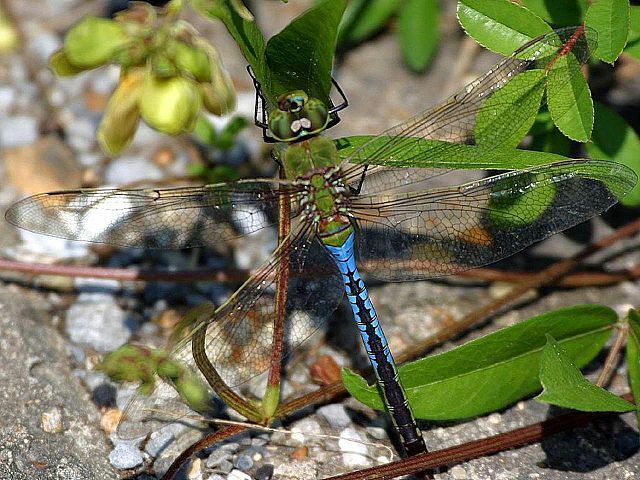 When I was in Maine, on a run through the green hilly countryside, I came across a farm with a clay pit where enormous colorful dragonflies hovered over the standing water, ten times larger than their southwestern Virginia cousins, like trucks compared to motorcycles. I’m not sure why insects are so large in less hospitable climates. New Mexico bugs will surprise people who think nothing can live in the desert. Think again. There are beetles and cockroaches out there that could carry a couple of fifty-cent pieces on their backs and not break a sweat (figuratively speaking). If you’ve read The Outlaw Women, the short story prequel to the Mae Martin series, you know that Mae is not least bit squeamish about crawly critters. When it comes to this topic, more readers may identify with her friend Jamie, who enters the series in Shaman’s Blues. He’s appalled by spiders in particular and by things with too many legs in general. Personally, I like the many-leggeds, but with a few exceptions: roaches, flies, mosquitoes, biting ants and skunk beetles. I think I’ve mentioned before that bees and wasps sometimes walk on me when I do yoga outdoors, their delicate almost weightless feet on my skin. On close inspection, they’re quite beautiful. Some of them have bright yellow legs, a classy touch like the hubcaps that match the paint job on 1950s cars. At a yoga and meditation retreat a number of years ago, Goswami Kriyananda came in a minute or two late to give his talk. He had stopped to help a fly that was trapped between a window and the screen. He opened the window, and then the screen, and closed the glass so the fly could go outdoors. He said it kept walking around and around on the screen in the same pattern it had before he offered it its freedom. With his warm and gentle humor, he said it reminded him of humans. Half-way between New Mexico and Virginia, my tire pressure goes down. It happens every year. Nothing is wrong with the tires. It’s just that I go to mechanics in Santa Fe and they make sure the pressure is normal for that altitude, and then I descend to the lowlands. When I unpack in Virginia, I always find that my shampoo bottle and other plastic containers have collapsed inward, folding in around the empty spaces inside them. When I run, I feel the heaviness of the air—the dampness as well as the low altitude. It’s hard work, like plowing through used teabags. Talk about coming down! It’s time to recompress. I’ll readapt to the climate, to the busyness of the academic year, and to the green campus, so conventional and normal. I’m in the transitional phase, now though. I miss the colors and textures of the desert, the people in T or C, the eccentric personality of the town itself, the spaciousness of my life there and all the open space around it—so delightfully situated in the middle of nowhere. The challenge now is stay spacious inside when my surroundings aren’t, and as external demands become like the air, an unseen weight leaning on me. I did yoga on my back deck today, and two tiny bees sat peacefully on my shoulder through several poses. I was grateful to have this practice of active mindfulness. It left me feeling whole and bright. My outer life has to recompress, but my soul doesn’t. 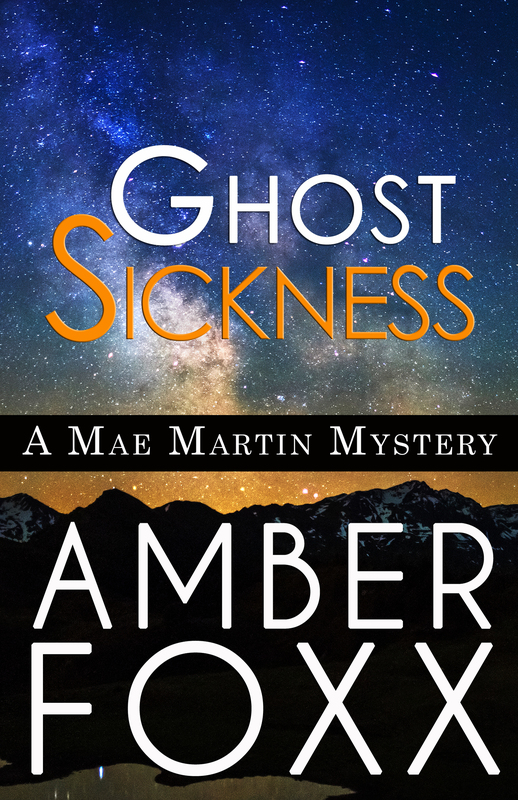 Some of my favorite places in New Mexico are featured in the latest Mae Martin Mystery: the Mescalero Apache reservation, where Mae finally meets her friend Bernadette Pena’s family and attends a ceremony and a powwow; and of course Truth or Consequences, my home and Mae’s. I enjoyed bringing a few of the local businesses and the work of one of T or C’s stellar artists into the plot—with their permission, of course. The cover image reminds me of Mescalero with its high mountains and its sky full of stars. A visit to the Mescalero Apache reservation turns from vacation to turmoil for Mae Martin. Reno Geronimo has more money than a starving artist should. He’s avoiding his fiancée and his family. His former mentor, nearing the end of her life, refuses to speak to him and no one knows what caused the rift. Distressed and frustrated, Reno’s fiancée asks Mae to use her psychic gift to find out what he’s hiding. Love and friendship are rocked by conflict as she gets closer and closer to the truth. If you haven’t started the series yet, now’s the time. You can buy the first book, The Calling, on sale for ninety-nine cents. Sale runs August 10 through 25 on major e-book retailers. Click here for buy links for all books in the series. Nothing lasts. Silver booms end, mining towns fade away, and buildings collapse unless cared for. Adobe slowly melts in the rare desert rains, returning to the materials from which it was made. A ghost town isn’t so much a place with ghosts as a ghost of its former self. I took a trip through three of Sierra County’s ghost towns (there are many more) with a friend who is a found-object artist and a dealer in antiques and collectibles. Having his perspective on the sites added to the experience, because he knew what things were when we found odd objects lying around,. Our first stop was in Cuchillo, at the partially-restored, partially-collapsed Old Cuchillo Bar. It shows the world a mangled face of original porch and windows—some broken—some of its original front and roof, new beams replacing portions of the fallen roof, and open space where the weather can get in. My view through the window was limited, but my much taller friend said it looked like the original bar was intact. This place was long reputed to be haunted, but in the book Mysterious New Mexico, paranormal investigator Benjamin Radford describes his night spent in the place and how he examined the physics and mechanics of a seemingly self-opening cabinet. No ghost was required to explain its movement. The bar is for sale, if anyone feels inspired to finish the restoration and try to revive the ghost. The town has a few inhabitants and a colorful history. The winding roads on the way have glorious views of mountains and valleys—the empty desert that makes up most of Sierra County. Truth or Consequences, the home base from which we set out, is the county seat with a population around 6,500. In 1890, present-day ghost town Kingston boasted 7,000 souls, making it the biggest city in NM at the time. Chloride topped out at 3,000. Its current population? Eleven. Santo Nino Cemetery is hidden high on hill above the town, up a road so winding and rough I had the good sense not to make my little Fiesta climb it. Legs could handle it better. It has simple burials from the old days and more elaborate ones from recent times, but not many of each. The old graves are marked by patches of rocks and pebbles covered with weeds. The headstones are clearly not the work of a professional, thin slabs of natural stone scratched with rough writing. Many of the newer ones are decorated: with toys and angels honoring a child’s short life, or a rider on horseback made from horseshoes swinging a lariat, memorializing an old cowboy’s long life. The earth along the side of the road to the cemetery, where the hill had been cut to build the road, was layered with roots and rocks. On our way back through Cuchillo, we stopped to explore some desolate, crumbling houses. When I saw the old adobe bricks melting away with little dried teardrops of rain streaks in them, they looked very much the same as that slice of raw earth—small, beautiful stones of red and pink and green embedded with bits of straw in the dirt. The abandoned houses had stories to tell, but there was no one to explain the artifacts the way there had been at the museum in Chloride, so we had to do some amateur archaeology. One ruin had nineteenth century adobe bricks and a shredded pinkish gray fake leather easy chair sitting in an otherwise empty room where one wall had fallen away. A burned-out building with structural elements that suggested it dated back to the mining boom days had apparently spent part of the 20th century as a bar or restaurant, judging from the broken china, and the huge cache of scorched Pepsi cans and rusted soup or bean cans in one half of the building. The other half was full of rusted car parts– a lot of mufflers and carburetors. Too many for a family’s cars, and inside the house. I kept picturing a combination bar and garage. Amusing, but unlikely. We climbed up to flat area that looked as though it might have once been a campground or a trailer park, with nothing left but metal clothesline poles and a street sign that read Wyoming. I could sense Cuchillo ghosting away, hollowing out with time, changing but not dying.